I find it helpful to view certain tech industry moments as phases. These phases have some foundation in technology and the market’s maturity cycles. The PC industry went through a number of phases leading to where we are today. Mobile similarly has gone through its early phases and is now entering maturity both in technology and market/end customer phases. However, where the PC phase ended and is, for the most part, not changing much, mobile is entering uncharted waters. It is interesting to observe that the PC industry took computing only so far. Everything from size of desktops and notebooks (with their genuine lack of mobility), the complexity of the user interface, the need to learn to type efficiently and master the keyboard and mouse (to be PC literate), and high price points, has reached a total installed base of about 1.5 billion. It is important to note not all of the 1.5 billion PCs are owned by individuals. The individual owners of PCs in use is much lower by likely a few hundred million. The consumer portion of this number is in the 800m range. So, if we look beyond the business market, the PC took computing to just short of a billion people. The PC has peaked, reached maturity, and settled as a specialty computing product. To use a possibly worn out analogy, the PC is a truck. Turning to mobile, we see a different computing picture emerge. By achieving a smaller form factor (one truly able to be easily carried everywhere), dramatically less complicated user interface, and dramatically lower price points, the smartphone is bring computing to the masses in a way no computer before could have hoped to achieve. 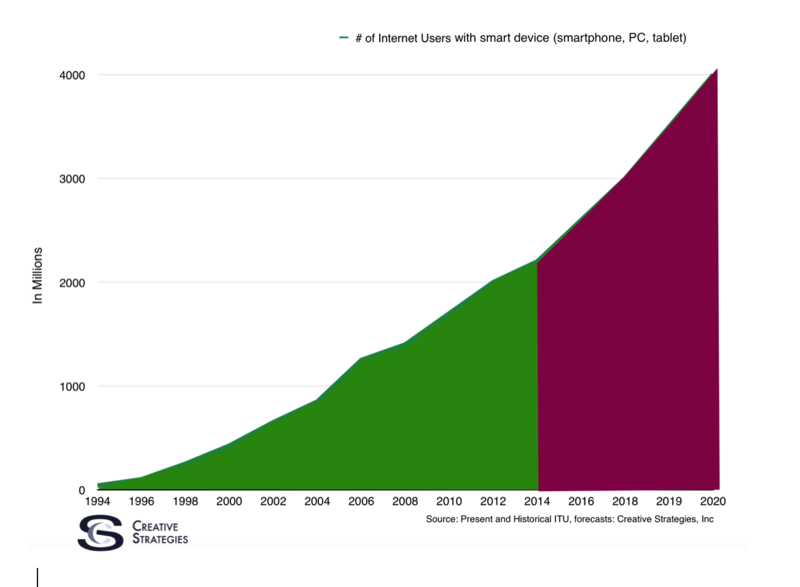 In doing so, the unique/individual owners of smartphones in use is nearing double that of the PC and will rise much higher. However, even within that context, a very important observation needs to be made. For the most part, this first phase of mobile grew from a somewhat technology literate/savvy customer. The vast majority of smartphones over the past decade have been sold to people who owned or were familiar/literate with a PC. Smartphones, for the most part, have reached saturation in developed markets like the West, Eastern Europe, and more developed regions in emerging markets like tier 1,2, and 3 (the more developed) cities in China and India. In fact, as I look at the regions of emerging markets where smartphones have the higher installed bases, it maps very closely to specific areas of those markets where PC penetration is high. The next phase of mobile is about bringing computing beyond those who are tech savvy or have PC literacy. But first, some points on the current smartphone market. Benedict Evans is known for stating that, in this phase, Apple and Google both won and this is true. However, I’d revise this statement to say Apple and Google both got what they wanted. Apple sealed up the top end, most profitable customers in this first phase of mobile — 400-500m of them by now. Android got a global critical mass of customers, which supports a certain type of business model. Google’s Android has approximately a little more than 1 billion global users. China’s versions of Android has roughly ~450-500m and the iPhone has approximately ~425-450m of a global installed base of smartphones of over 2 billion. ((While some percentage of smartphone owners today have multiple sims, and in some cases multiple smartphones, the individual/unique owners of smartphones has to be nearing or just past 2 billion). I created this chart, which I detailed (among other things) for our Insiders on the smartphone market in a report. 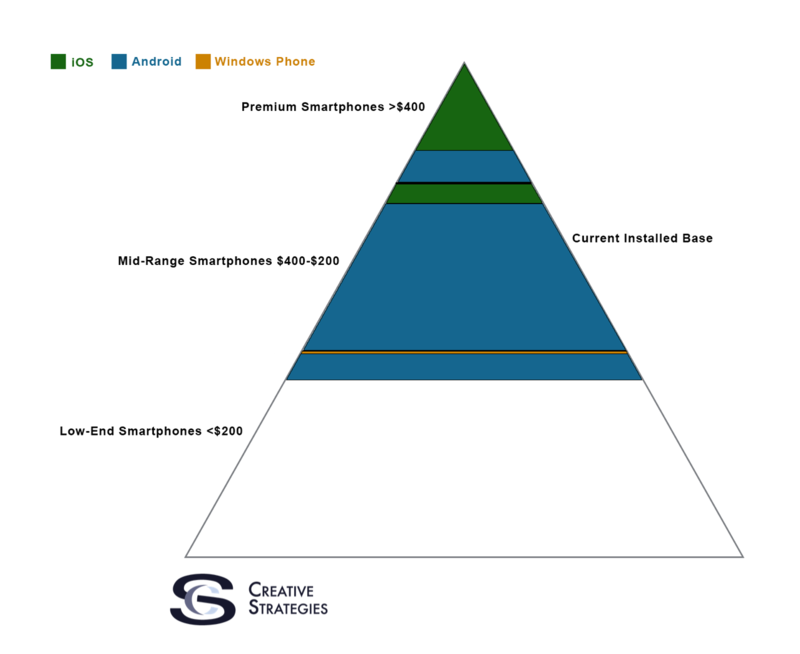 It is a picture of how I visualize the platform share within the smartphone price ranges of the first phase. As you can see among the top end of price ranges, Apple has the majority and their share appears to be increasing. Android has the vast majority of the rest. The bottom is left intentionally blank since, at this point in time, we do not know nor should we make vague assumptions about the OS which will dominate this next phase of mobile. How we got to where we are today in smartphones has been clear. Apple and Google/Android both got what they wanted and what happens during this next phase, the subsequent filling out of the empty part of the above chart, is going to be fascinating. To illustrate this next phase I’ve made this chart. This is the historical and future projection of internet users. I make the observation that, over the next 5-6 years, we will add more Internet users than in the previous 30 years. This will be driven mainly by two things. The conversion of approximately 2 billion feature phone users to smartphone users, and smartphones costing less than $100 (in many cases less than $50). This is the foundation of the schism I see happening for Android. Google has a base of rapidly maturing customers (just over a billion of them) who will continue to expect innovation around the platform in areas they consider valuable. Areas around cloud, imaging, sensors, and so much more. Android’s current user base is increasing in their sophistication. As computing advances, so should Android for this customer set. Yet, in this next phase, Google is going to also want Android to appeal to a first time smartphone user, say a farmer in Africa, for example. So the question is, how does Google evolve Android to cater to both their most sophisticated, demanding, and profitable existing customers, and a first time customer in Africa who is absolutely not PC literate and may not be literate at all? This creates a fundamental problem at a platform level and at a business model level, for Google. This is why I say we can’t make assumptions about which platform will win with the next two billion. The user base in question is using feature phones today. They make calls and have type literacy around 10 key and or radio/TV dials. This is the extent of their technical literacy with electronics. It is in addressing this next phase of mobile where I believe the Android schism happens. Could it be an Android fork like Cyanogen has the most potential in this next phase? Could it be Windows Phone has an opportunity? Or maybe a web platform version like FireFox OS, that simplifies everything to web apps? Or perhaps Google figures it out, or comes up with something completely different than Android to address this new set of customers. The point is, we have no idea. It is a green field. It is uncharted territory for computing. However, a question I’ll leave hanging: Is there opportunity for a new platform in the areas Google chooses to not address and, if so, is that user from the first phase or do they exist in the second phase?